Ramadan Series - The Utimate Eid Guide. Do you remember the times when you were young and were given Eidi by relatives and it was instantly taken away by our parents in the name of 'saving' and never to have it back? Yeah, that happened with me too. But in todays day and age, the generation is quick to point it out and take care of their own money/savings. And I know giving cash is the easy way out and it teaches the children how to spend and save but there are times when you want to personalise a gift for the child so that they can benefit from it and not just cash up. 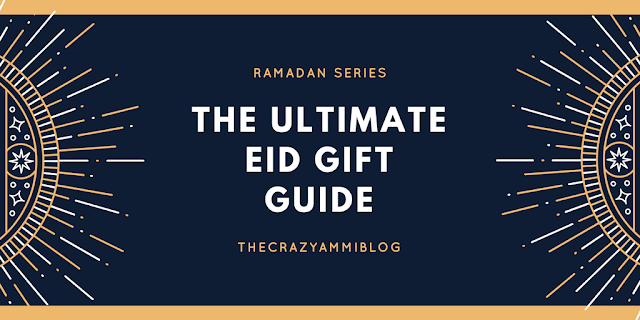 So, here is a small Eid gift guide that can help you with deciding what to gift to the children this Eid and make them gain benefit and educate themselves with our religion. 1. My First Wudu Book. This has to be my absolute favourite out of the lot! I wish we had something like this during our childhood and when we were learning about the factual things about Islam. The sorcery of this book is that all the pictures are black and white. But when you run water over it, the pictures change colours. My son was super stoked to use this and has nearly learnt his wudu. This books is great for children aged 2 and above. Buy it from here. 2. My first book of DUA. It is safe to say that all the items from the entire gift guide are my favourite. I personally have kept this book for myself (cheeky, I know). There are so many basic duas in the book that we often tend to forget. My First Book of Dua is for children aged 7 and above. However, if smaller children know how to read and speak arabic, this is suitable for them too. This book shows literally ALL the duas that are supposed to be read in our daily life. Also including duas for Hajj and Umrah. And the best part? There are small paragraphs explaining why the duas are to be read and the history behind it. Its easy to read with english translation along with it, beautiful illustration and its the perfect way for little children to learn how to remember and thank Allah. Buy it from here. I have found two versions of these. One is the Remind Me Dua cards that you can put up all around your house so that the children are reminded of the duas to be read daily. There are 6 large cards with extremely beautiful illustration, again. You can purchase them from here. They other version is the What To Say When cards. These are type of flash cards that can be very very handy to help the children learn about all the duas that you need to say during our daily routine. They are very handy, double sided (30 dua's) and can also be placed around the house (I personally keep them at hand for daily learning purposes). You can buy them here. You can even read the full review here. If you come to think of it, how well do we know our basic arabic alphabets? 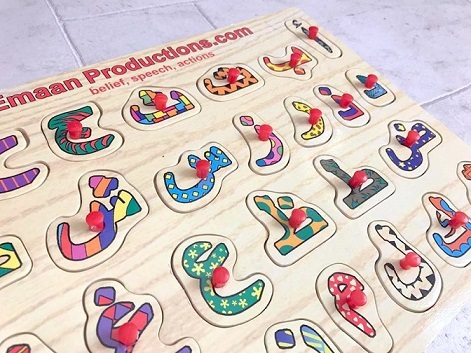 So to make the child learn arabic alphabets from a very early age, these arabic alphabet puzzles are one of a kind. Not only they help the child with learning, they develop motor skills too. You can buy these from here and read the full review here. 5. Talking dolls and Dua pillow. How cool are these? Every little child loves dolls and talking dolls are just cherry on top! These talking dolls from Desi Doll Company are lit!! When you press their hand and feet, they recite essential Quranic words and phrases, Surahs followed by translation and fun songs about Islam. You can purchase them here. The Dua pillow is my favourite! You have buttons all over the pillow and you can hear the dua's for sleeping, waking up, ayat-ul-kursi, nasheeds and the three Quls. How amazing is this? The kids are going to love this! Buy it here. Have you decided Eid gifts as yet? That's indeed a great selection of gifts to buy for kids this Eid. My parents never took away our Eidi (money wallets) from us. I think they're the only ones who didn't... otherwise everyone else I know of, say that their parents used to take their money away from them (including my husband). I love these ideas! We have the wooden letters but I just adore the idea of the wudu bath book! So brilliant! A lovely selection...I have been thinking to get the dua pillow for Bee. I actually needed this kinda post to get an idea about Eid gifts. Oh such a brilliant post I recently created an Eid gift guide and included the (Desi Doll) talking dolls , I totally agree with you they are cool!